The Vixen HR 1.25” eyepiece range is specifically designed for the observation of fine details on the surface of the planets and the moon. These 100% made in Japan eyepieces deliver high resolution, breathtaking images with extremely high levels of definition and contrast. Eyepieces are generally constructed from 7 or 8 lens elements. The Vixen HR series is constructed with a 5 element, 3 group design to achieve the best possible light transmission. 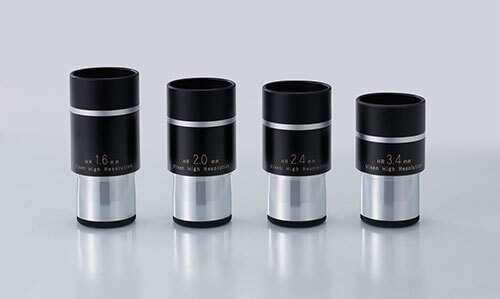 All HR eyepieces have baffle rings in the barrel to eliminate stray light. They are suitable for Newtonian telescopes with fast primary mirrors such as the Vixen R200SS. The top of the range quad element AX103S ED refractor is another great partner for these specialist eyepieces.